Even though baby boomers are aging, they’re still setting trends. Case in point, the aging-in-place movement. Opting for remaining in the homes they’ve lived in for decades as opposed to heading to warm-weather retirement communities, a growing contingent of older homeowners are staying put. Aging in place, however, means adapting your home to make living easier and safer as we get older. And the bathroom is a smart place to start. New Jersey-based Gold Medal Service, a heating, cooling, plumbing and electrical service company, recommends the following bathroom remodeling tips that will accommodate limited mobility or physical impairments. Remodel the bathroom on the main floor. If you have a house with multiple levels, focus on the first-floor bathroom, which is hopefully adjacent to a first-floor bedroom. This will allow aging homeowners to avoid stairs altogether. Provide extra space in the bathroom. Make sure there’s enough room in the bathroom to move a wheelchair around, should one be needed down the road. Have doorways set to at least 32 inches wide, and ensure that there’s enough space to position a wheelchair next to the toilet, bath or shower, to enable a safe and easy transfer. Stick with non-slip floors. Non-slip tiles are a must to prevent slipping and tripping on the bathroom floor. Loose rugs can be hazardous, so stick with non-slip materials. 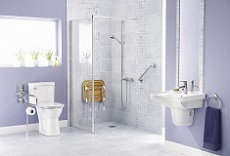 Make tubs and showers more accessible. Older bathtubs can easily be replaced with a walk-in bathtub. Consider having a seating area in the shower so an individual doesn’t have to remain standing the entire time while showering. And be sure tub and shower surfaces are non-slip. Add grab bars. Using towel rails as grab bars is a major safety risk as they will not support a person. Instead, install grab bars following manufacturer’s instructions carefully. Place them next to the bath, shower and toilet. Mind the lighting. Make sure you have ample lighting in the bathroom with a minimal amount of glare. Have an elevated toilet seat. Standing up from a low-set toilet can be difficult as we get older. Consider extra accessories. Properly locating things like soap dishes, shaving stands and shower caddies will make using the bathroom more convenient and safer. Use low-maintenance materials. When you remodel your bathroom, consider using modern materials that are easy to clean, mildew-resistant, and have a lifetime guarantee. If you’d like more information about homeownership, please contact me.